This post is sponsored by Princess Cruises. I have shared how to truly relax on a cruise and this strawberry colada drink recipe. It’s time to share another recipe inspired by my Mexican Riviera with Princess Cruises. 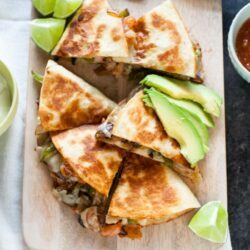 These are so ridiculously simple to make, you can make it for dinner or make a few for appetizers for friends when they come over. Totally up to you! 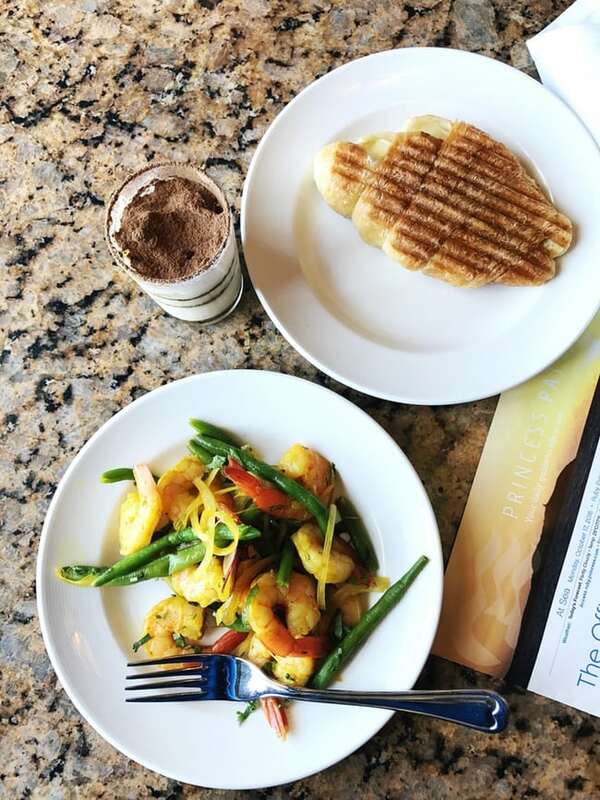 This shrimp & green bean curry salad that I had almost every day while on my cruise. This is my second Princess Cruise and I remember this dish from my last cruise to Alaska! Cut up the veggies, including the mushrooms. First cook up the mushrooms and then clean the pan…next up the peppers and onions. This is how I cook quesadillas! So you have some sealed edges…this was Curtis’ genius idea years ago. 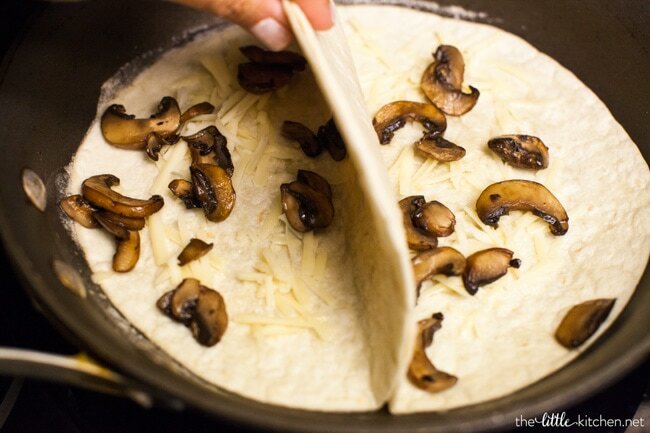 Add the cheese and mushrooms. Then, the onions, peppers and then shrimp and then add more cheese! I know you want these and I know you want to make them! If you don’t like the mushrooms, you can totally omit them! 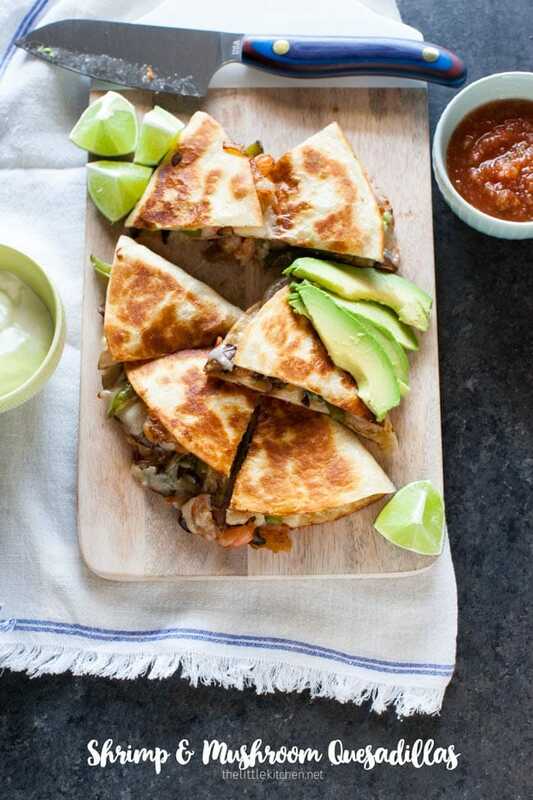 Serve with a squeeze of lime, sliced avocado, salsa and sour cream and you’re golden. So easy to make…let me know if you make them! Peel and clean the shrimp. Slice in half length-wise. Using a paper towel, dry off the shrimp. 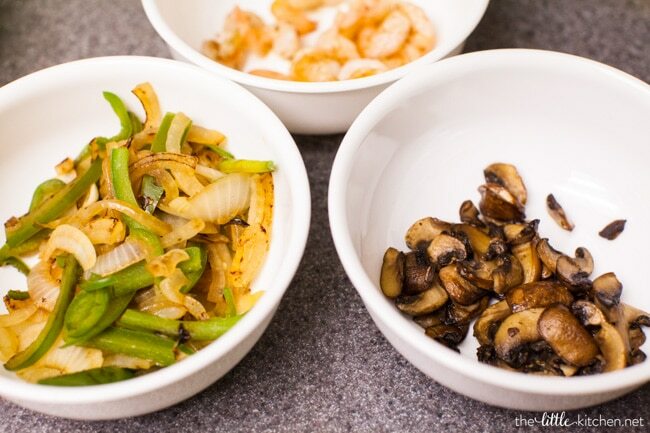 Put 1 teaspoon oil into a non-stick skillet and cook the mushrooms on medium heat for about 5 to 6 minutes. Remove mushrooms and set aside. Wipe down the pan with a paper towel. 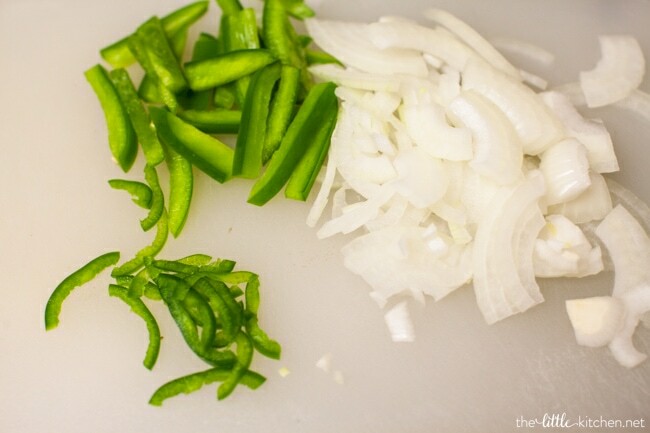 Next, add 1 teaspoon oil into the pan along with the green pepper, yellow onion and jalapeño. Cook on medium heat for about 3 to 4 minutes. 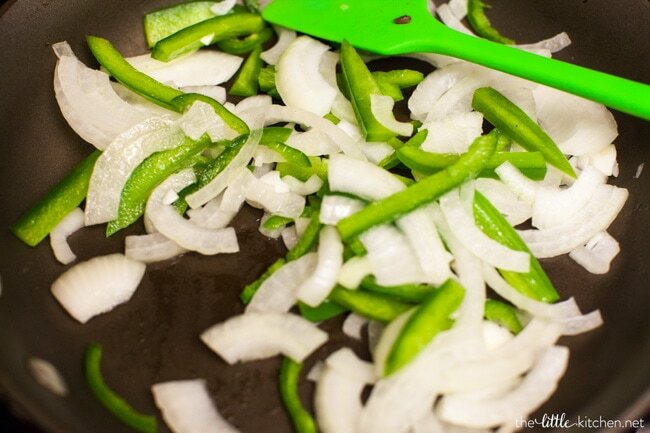 Remove vegetables from the pan and set aside. Wipe the pan again with a clean paper towel. Melt 1/2 Tablespoon of butter in the pan on medium heat. Season the shrimp with salt and pepper and add them to the pan and cook for 60 to 90 seconds on each side. Remove from the pan. 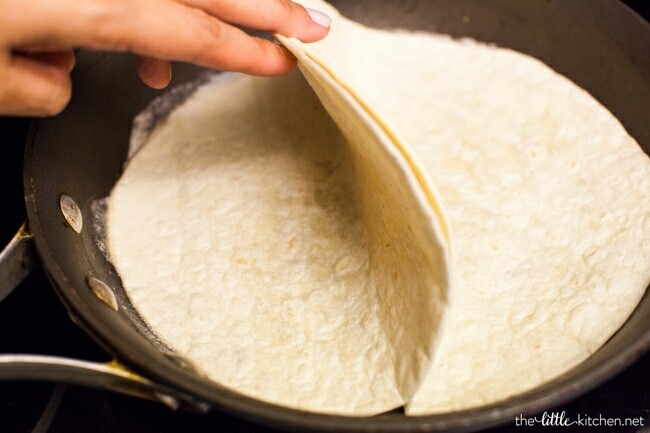 Melt another 1/2 Tablespoon of butter in the pan and add 2 tortillas to the pan, half of each touching the bottom of the pan. 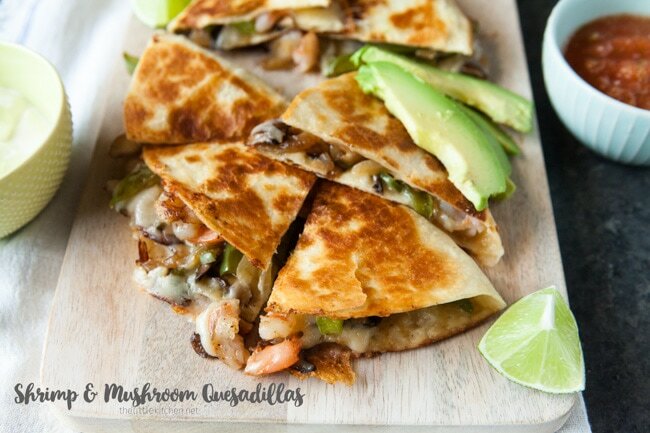 Put 1 Tablespoon of cheese and half the of the mushrooms on each tortilla, along with half of the onions and peppers. 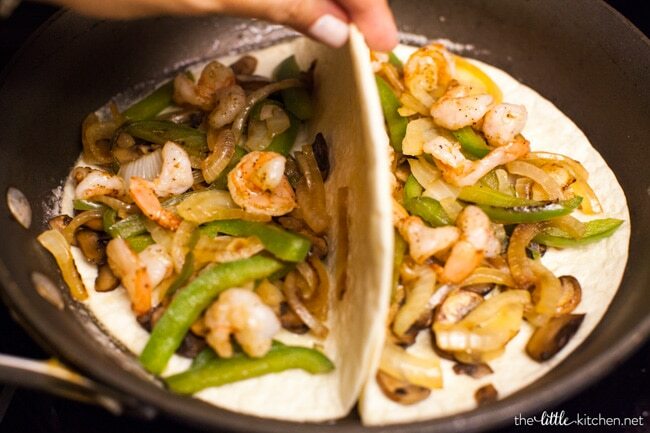 Then add the shrimp and 2 Tablespoons of cheese on each tortilla. 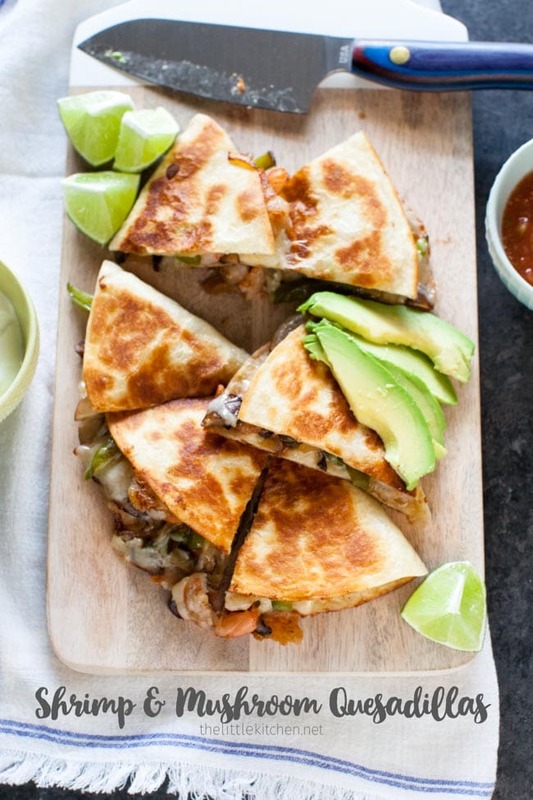 Close the tortilla and continue cooking for about 2 minutes. Flip over and cook for 3 to 4 minutes, until the desired doneness on the inside and outside.